SmartSweets Reviews - Is It Really a Way to Kick Sugar? 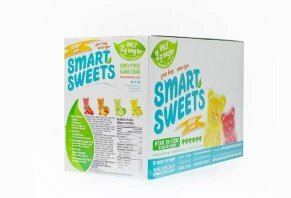 SmartSweets are low-sugar gummy bear candies that are made with Stevia and other natural ingredients in order to substantially cut down on sugar content. Promising to present kids and adults alike with a healthier alternative to current candy options, SmartSweets is the brainchild of 23-year-old Tara Bosch, who was originally inspired to create the treats after forming an unhealthy relationship to food and experiencing the negative effects of sugar in particular. She claims that after months of testing various recipes in her kitchen in Vancouver, B.C., she finally came up with the formula for a candy that you can “feel good about enjoying.” SmartSweets are sweetened exclusively with Stevia, a low-glycemic sweetener that is extracted from Stevia Rebaudiana plants. Beyond these basic differences, the company claims that their products are non-GMO, gluten-free and allergen-friendly, saying that they are manufactured in a dedicated gluten, peanut, tree-nut, dairy, soy and casein free-facility. Clearly, they have a vision of a world where eating tasty treats doesn’t have to be so detrimental to our health, but do their first products, gummy bears made from these alternative ingredients, truly deliver on this front? Are SmartSweets Really a Way to “Kick Sugar” While Keeping Candy? One of the key innovations found in SmartSweet’s first two products (of which many more are apparently planned) is the shockingly low amount of sugar included with each serving. Each full bag of gummies contains just 2 grams of sugar, which is noteworthy when compared to the average bag of a similar candy like Sour Patch Kids, which weighs in at 92 grams per bag. In addition, the product’s five flavors – raspberry, peach, green apple, and lemon – are all made with natural flavorings; no synthetic sweeteners, preservatives, or anything artificial in general is used. The website also illustrates that each bag contains as much plant-based fiber as six servings of green vegetables (which equals about 24 grams). For coloring, SmartSweets utilizes carrot and beta-carotene, again removing the dyes and food colorings often used in more mainstream products. So, what does this really mean for you? Though we haven’t tried out SmartSweets ourselves, and personal taste is certainly a crucial factor here, we can still see how these Stevia-sweetened candies could be an excellent option for those with an oversized sweet tooth, especially if you’re looking to cut back your sugar intake substantially. Seeing as excessive consumption of sugars have been linked to diabetes, liver issues, and even cancer, SmartSweets seems poised to deliver a compelling alternative that may be just what you’re looking for–if you like the taste, of course. As of this writing, SmartSweets were available both directly from the manufacturer online and on Amazon.com in the US. In Canada, they seem to be available in a number of retailers as well, including Whole Foods and Bed Bath and Beyond. Online, they are sold in two main varieties; Fruity and Seriously Sour. Through the manufacturer, you can get either type for $18.63 per 6 bags or $37.26 for 12. There is also an option to subscribe and save 5 percent, having a new shipment delivered monthly. Shipping is $5.65 in the US. On Amazon, they are sold only in 12-bag quantities for $49.99, plus free shipping. You’ll have the standard 30-day return policy to fall back on through Amazon, and if ordering directly from the main website, the terms state that you can send an email to hello@smartsweets.com within ten days of shipping to get a refund on your entire order. As the shift towards more holistic and natural food choices becomes more and more commonplace, it seems as though many of the (potentially unhealthy) indulgences we partake in on a regular basis are beginning to face competition from health-conscious alternatives like SmartSweets. That said, are there any other compelling options to look out for in the candy space? During our search, we weren’t able to find any additional gummy bear products that were able to match SmartSweet’s balance of ingredients and nutritional content. We did come across some sugar-free gummy bears from Haribo, though looking on Amazon, it seems as though many commenters have reported gastrointestinal issues after consuming the bears. They also did not include the same amount of fiber as found in the Canadian product. See Also: Sugar Versus Artificial Sweeteners: What’s Better for You? Meanwhile, SmartSweets had 37 reviews on Amazon, the majority of which were five stars. There were also over a hundred five-star ratings on the manufacturer’s website. Be aware of how much sugar and fat content you are consuming on a regular basis. Even if you were able to lower this number by a marginal percentage, you’d be well on your way towards a healthier lifestyle. Sometimes the smallest progress can build towards something transformative. Look for products that use natural sweeteners, like Stevia and others. These sorts of snacks are often healthier in other respects as well, such as including less (or no) preservatives, artificial flavoring and colorings, and other filler ingredients. Focus on learning and implementing good portion control habits. Many snacks become noticeably unhealthy only when they are consumed too often, and in too large of a portion. Practicing good portion control and understanding how much you are taking in on a daily, weekly and monthly basis is one of the first steps towards a healthier diet. Don’t be afraid to get creative when it comes to finding healthier snack options. You can always substitute nuts for chocolate bars, or fruits for processed candies and treats. Pro tip: try freezing some blueberries or grapes for a tasty (and healthier) cold snack. Is it safe to say that SmartSweets delivers on its main goal of kicking sugar while keeping the candy? Based on the information we gathered on the product’s website, as well as info from several popular candy manufacturers, we feel that it’s reasonable to say that the low-sugar treats are a step above many other confections when it comes to nutritional value. The impressively low-sugar formula is the star of the show here, but when coupled with the high plant-based fiber content and lack of “artificial anything” (as the manufacturer puts it), as consumers ourselves, we can certainly envision many people finding great value in what’s on offer here. That said, SmartSweets seem to be more expensive than many of the “traditional” candy offerings out there, and in the end, it’ll be up to you to decide if the health benefits (and crucially, the taste) are worth the additional cost that likely comes from using such unique and wholesome ingredients. There’s also the matter of availability; while basic candies can be found in almost any corner convenience store in America, SmartSweets are currently only in-stores in Canada (though there are plans to change this in the near future). Overall, SmartSweets seem like a compelling alternative to the standard array of snack foods available today. If you decide to give them a try and find that they just aren’t for you, be sure to keep in mind the 10-day (or 30 on Amazon) return policy included with your order. I am currently on WW and always looking for good treats and snacks that are low calorie, and let's face it, healthy. These are so good I want to share them with the WORLD. The taste is amazing. I tried both sour and regular and love them both since I love all types of gummy bears. Definitely worth the price and will be reordering! Write a Review for SmartSweets!